Increasing world population, rising food demand, limited water resources. Currently 70% of the fresh water uptakes are already used for irrigation. The need for efficient water use in agriculture is undisputed! The United Nations’ Sustainable Development Goal 6.4 is set at the improvement of efficient use in order to reduce water scarcity and maintain food security. Member states like The Netherlands invest in projects that aim at this improvement in arid and semi-arid regions world-wide. Multiple key actors are involved in this complex global issue. Before getting to the actual field where improvement is to be made, on policy level and in research already we find various perceptions on efficient water use. Water-use efficiency, irrigation efficiency, water productivity, water saving. What indicator represents the issue accurately? What is the physical meaning of the various terms that are being used? How are the different existing perceptions quantified at the agricultural field? What strategies would obtain the desired result? Charlotte van der Leer-Groen is working on this topic for her MSc thesis Water Management at Delft University of Technology. She expects that present perceptions on improvement of efficient water use in agriculture can result in differences and even conflicting applications at field level. She uses the hydrological Soil-Water-Atmosphere-Plant model (SWAP) to apply different scenarios for improvement at the field and to evaluate all possible indicators from the generated output. 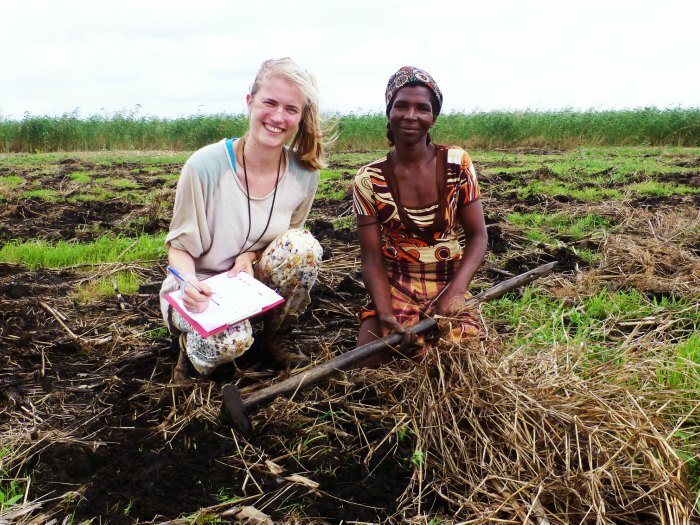 Charlotte van der Leer-Groen in the field in Mozambique. One of the cases simulated in SWAP for this analysis is the maize cultivation by smallholders near Xai-Xai where the ThirdEye project is carried out. FutureWater supported Charlotte in May 2017 during her visit to the area. She conducted field measurements to collect data for the simulation. Another purpose of the visit was to understand the current situation and investigate the perceptions of local key actors. A group discussion with farmers was organized and multiple personal interviews were conducted with government officials, farmers and other local experts both in Xai-Xai and Maputo. Among local actors different perceptions on efficient water use appeared but a need for improvement was expressed unanimously. Where the conflicting result of different perceptions can be intuitive, the simulation with SWAP also allows a quantification of these differences. This research is an important contribution to the discussion on efficient water use. Improvement of efficient water use can be discussed in general terms but the aimed improvement ultimately takes place at the field and will be a challenge in the coming decades.